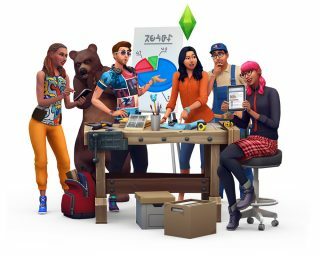 Today is the first major inflection point for this upcoming Stuff Pack, and we’re looking to you and The Sims community to guide this pack through its critical steps of development. We’re going to ask you the same questions we ask ourselves, and ultimately we’ll have a pack we can all be proud of. Development here in Maxis is always a collaborative process, with input from multiple disciplines to shape everything that we create. By adding your voices and your feedback, we’re going to make a Stuff Pack that represents your desires. From now until April 6th, we’re gathering your votes at the bottom of this blog to help select the theme of this Stuff Pack. At this early stage of pre-production, we pair potential features with a theme to help conceptualize the pack we aspire to create. You’ll see those features mentioned in the survey, but to be clear – you are not selecting specific features in this vote. Feature selection will occur in a separate vote, at a later time in the campaign. The entire development of this new Stuff Pack will give you a transparent look into how Maxis works together to make new experiences for your Sims. Not only will your votes help determine what we create, but we’ll also be sharing in-depth information about our progress throughout the development process. We’ll show you images and videos of the Stuff Pack throughout development, so you can see what we see when we’re building the game. You’ll have a window into our process, be it an inside look at the meetings we hold, to gaining insight into how we respond to unexpected challenges. Along the way you’re going to meet other developers on our team, and learn about what they contribute. You can take part in a new section of our forums that’s dedicated to this project. It’s there that we’ll post regular updates, and we’ll jump in to engage in spontaneous discussions. Your feedback in the forums will be another opportunity to help shape the course of this pack. Of course, participating can be as simple as just voting. Be sure to circle the following dates on your calendar, and return to TheSims.com to make your voice heard. • Theme Vote (April 3rd - April 6th): Select the overall theme for the pack. Every part of the pack will be influenced by this key decision. • Art Style Vote (April 10th – April 12th): Select between proposed art styles for the pack, which will guide our concept artists in the objects and clothing they create. • Objects & Clothing Vote (May 18th – May 21st): Browse through the concept art we’ve drawn for the pack, and select your top choices to help us determine which objects and pieces of clothing are included. • Feature Vote (June 23rd – June 26th): Select the top gameplay feature(s) you want to have included in the pack. • Pack Icon Vote (Fall): Peruse different icons and select the one that will appear in the pack's box art and within the in-game catalog. • Pack Title Vote (Fall): Select a title that best summarizes the pack's atmosphere and content. For years, we’ve worked to make Sims games that we think you’ll love. This unique opportunity to work directly with all of you has our team incredibly excited. So come on… put on your honorary Producer cap and come join us. Let’s build something great, together. We can’t wait to learn more about what we’ll start making in just a few short days! Be sure to read our FAQ on this new project for additional information. Twitter and Instagram, Like us on Facebook, and Subscribe to our YouTube channel. Having trouble loading the survey on mobile? Tap here.